This is a no-bake feast. It takes 4 hours to chill so make sure you make this in advance. You can make up to the end of step 4 the day before you need it and top with the cream just before serving. We've layered a custard cream base with a blueberry cheesecake layer, topped with a purple white chocolate layer and then covered in whipped cream and white chocolate chips! It's a real crowd pleaser. You will need a 23cm/9in square loose bottom cake tin, lined beneath the base with 2 crossed strips of parchment that come up and over the sides of the tin. This will help release the cake. Blitz the custard creams in a food processor to a fine rubble, then add the butter and blitz again until it begins to clump together. Press into the base of the tin and level out. Put the tin with the base into the fridge while you work on the layers. 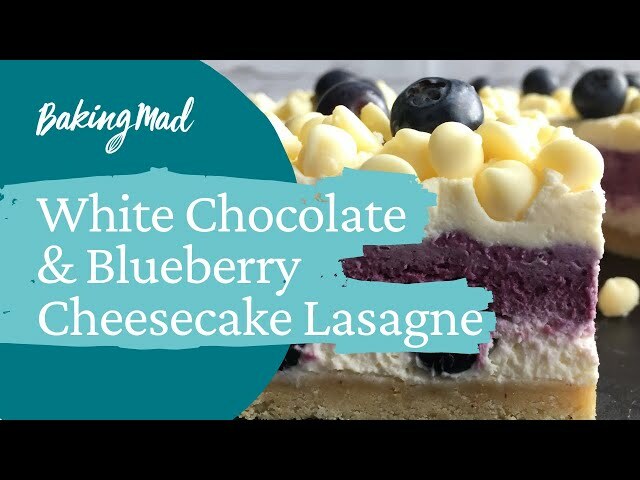 For the blueberry cheesecake layer, gently soften the cream cheese with a wooden spoon in a large bowl and beat together with the icing sugar. In another bowl whip the cream until it is thickened but not holding peaks, fold this into the cream cheese. Add the vanilla and lemon juice and finally fold in the blueberries. Spread this mixture over the biscuit base. Place back in the fridge to set. For the purple white chocolate layer, carefully melt the chocolate in a bowl over a pan of simmering water, then set aside to cool. Blitz the freeze dried blueberries in a food processor until they are a fine dust. Gently soften the cream cheese with a wooden spoon in a large bowl and stir in the cooled white chocolate and then stir in the blueberry dust. In another bowl whip the cream until it is thickened but not holding peaks and then fold this into the cream cheese mixture with the lemon juice and vanilla. Spread this over the blueberry cheesecake layer and make it as level as you can. Place back in the fridge to set. strawberries or raspberries can be used as an alternative. Allow the lasgane to set for 4 hours over overnight in the fridge. Keep refrigerated. Best eaten on the day it is made or one day after. Nice recipe, just made it so not tasted yet but the recipe needs a few adjustments. Some of the ingredients are not included in the method, we muddled through though and took a few guesses! Apologies for the blips in our recipe, these have now been fixed. We also have a video that accompanies this recipe for extra help. We are pleased to hear that you enjoyed this bake.